I fly into Maseru, the capital of Lesotho, discovering, only when my passport is demanded, that it is a separate country from South Africa . It’s also a complete contrast to what I’ve seen so far. I skid, in my hired Corolla (with CD player blaring more Johnny Clegg) down very rural dirt tracks. I’m glad it’s not my own car. 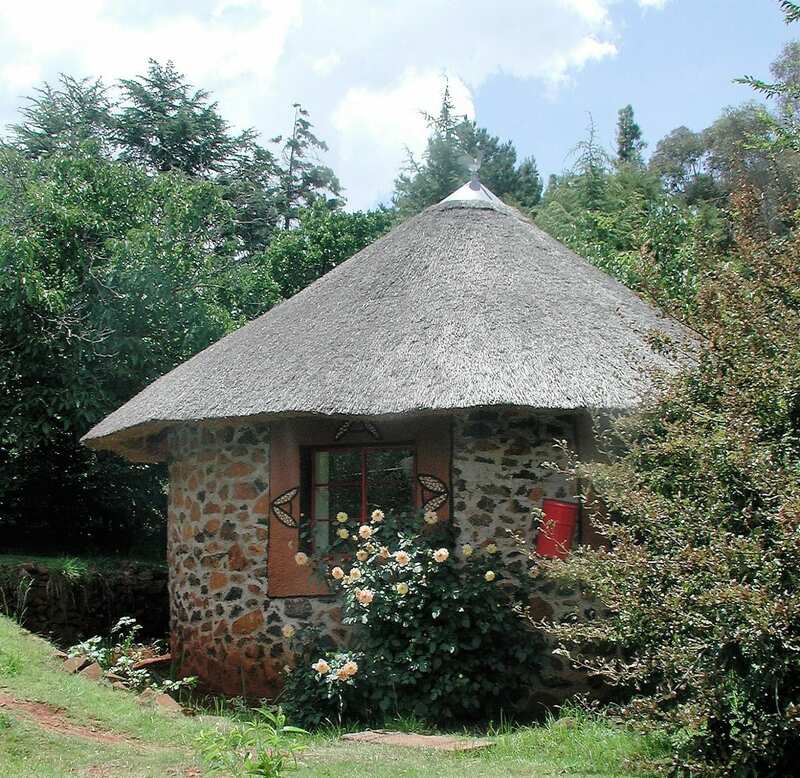 On the edge of the Drakensberg Mountains, there are wild pale emerald fields, rich red soil and soaring spiky aloes. Also a rusting road barrier, and the local bobby. To Malealea. Shell and flower covered stone rondavels, peacocks with pea-chicks (as opposed to chick-peas), stunning scenery, pouring rain, dramatic thunderstorms and two rugged Afrikaner adventure tour operators. 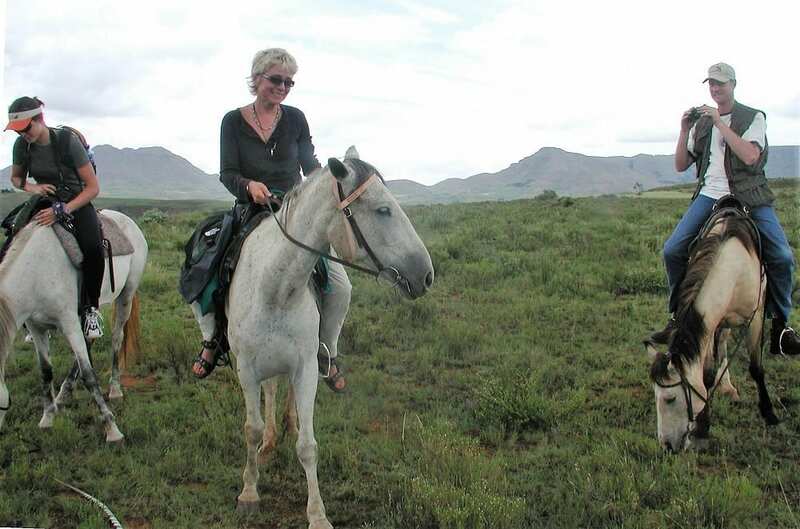 The dynamic duo, Johannes and Andries, are in charge of pony trekking, rock climbing, 4 WD driving (constant competition as to who can be the most manic driver), abseiling and river rafting. I choose the least potentially exhilarating of the options on offer and go pony trekking along the mountain ridges. Well, the pony ambles along The Ribeng Gorge edge, walking where it wants and eating when it wants and takes me with it. I’m very happy, except when my recalcitrant pony tries to bit me)- the views are incredible. A few of the locals, wrapped in multi coloured wool blankets, wander along with us, chatting amicably. two six year-olds are puffing away on cigarettes. The next day’s trip to the waterfall is cancelled- everyone is ill, I’m told. I’m not too disappointed as it’s been thunder and lightning all day and I’ve played cards with Andries all afternoon. The next day it’s still the pouring with rain, but we’re river rafting i I’ve no idea what the scenery is like. I can’t see. The men do the paddling and their little Staffie terrier, Josh spends the whole day scrambling on and off the inflatables, terrified, leaping onto dry land and then back again as she sees us disappearing into the distance. 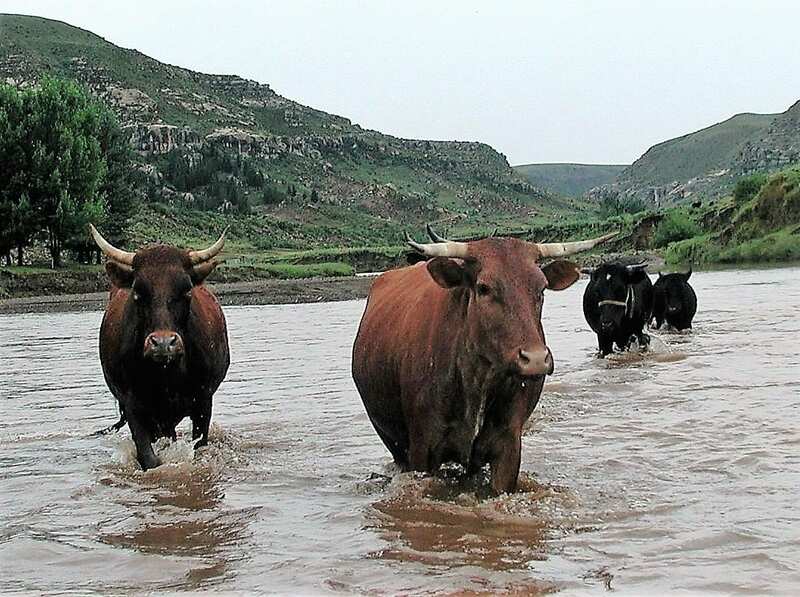 She’s not the only animal swimming, as cattle too, follow us along the river bed. There’s no cell signal at Malealea. I drive to the top of Paradise Pass six kilometres from Malealea Valley where I’m staying and scramble to the top of the hill. Thee mobile works here. I meet two Swiss girls texting their boyfriends. “Cell Phone Hill” we laugh. In the evening we have a camp fire and Andries croons Leonard Cohen to his guitar. Lady Midnight follows me to bed. Onwards, to Durban. 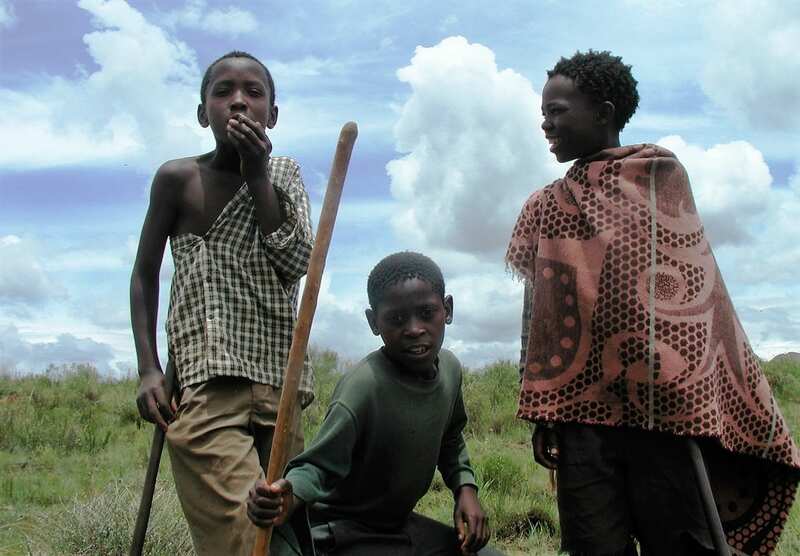 To see more of my photos of Lesotho, visit this page. 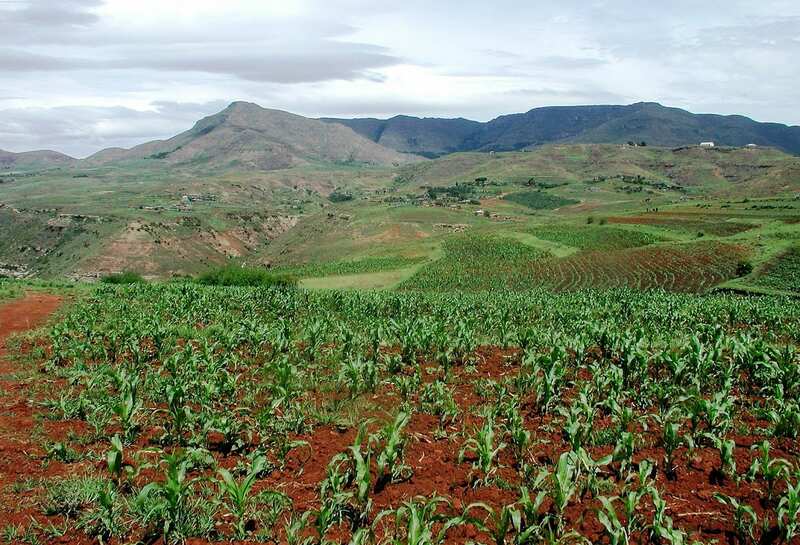 Lesotho is known as “the mountain kingdom”. The lowest point above sea level in Lesotho is 1500 metres, making it the country with the highest low point in the world.